News - 2016 BIG CHALLENGE PRIZES! Check out the Big Challenge Prizes for 2016. Every participating student gets a poster of London or New York and a diploma and many will receive an additional prize: books, calendars, school diaries and pencils. 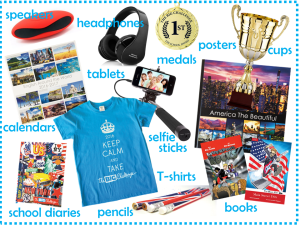 Top students will win medals, Bluetooth speakers, headphones, cups, T-shirts, tablets, the magnificent ‘America The Beautiful’ photo book as well as trips to New York and London and a chance to take the Cambridge Examinations. Nice, I really need new hedphones for my best friend Adelina Norlin. There is not iPhone X 😒😂 ! the prizes is not very good but it’s better than nothing ! I really want to win this year! I hope there are better prices. I like the prizes but for 2018 you should do iPhone X ! It’isnt unfair , it’s only Luck. I hope that I will have some really good prizes like cups and tablets for the big challenge of 2017. I have trained a lot to get good marks so why not in this contest ? So good luck for everyone and may the best person win ! YES! I’m so excited to do the BIG challenge, it’s my first time! This prizes are very good!! !